This title provides everything you need to know to create and maintain a stunning garden throughout the year, with 10 inspirational and practical books. Planning and maintaining a successful garden - one that meets the needs and aspirations of the owner - is an enjoyable and creative process. The skills required can be mastered by everyone and are clearly explained in this beautiful set of books. The tasks involved in creating and improving a garden are divided into manageable units, to help you maximize the potential of your site. So if you dream of borders of colourful and scented blooms, a healthy green lawn, a patio in which to relax, or even low-maintenance ideas to lessen the workload, here are the skills to guarantee success. These handy books also make it easy to devise planting schemes that incorporate year-round colour, architectural shapes and different plant textures into the garden. There are plenty of schemes for colourful, fragrant, and even edible, hanging baskets and window boxes, as well as ideas for filling space with annuals, and incorporating perennials and shrubs into your garden design. 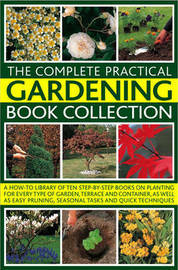 With over 1200 colour photographs and accessible and informative text by respected horticultural experts, this comprehensive set of gardening guides will give inspiration and practical suggestions to improve any garden situation.